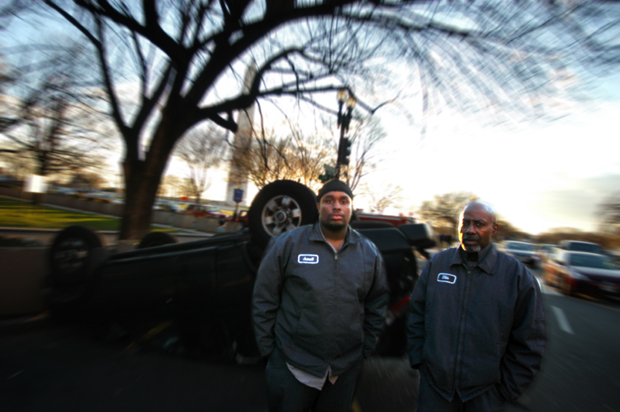 Jemala McCroee and his father Ellis stand in front of the Washington Monument and their flipped pick-up truck at 14th and Constitution NW. A woman in a small compact car hit the rear passanger's side of the truck while running a red light sending the truck and the McCroee's tumbling through the intersection. The McCroee's work for the Boeing Co. as renovation carpenters. This afternoon around the same time as the accident the CEO of Boeing, Phil Condit, resigned amid controversies. Smell a connection?